All St. John’s men are invited to a hamburger supper this Thursday, July 26 at 6 p.m. at the church! While there is no program planned, we will take a few minutes to talk about what we, as the men of St. John’s, might want to do moving forward. Your ideas and suggestions are encouraged! Our next all-church social event will be after church on Sunday, August 5! We will have a light lunch of cold-cut sandwiches followed by a variety of ice cream and toppings for dessert. During worship on the 5th we will have a Blessing of the Backpacks for all children and teachers who are preparing to start the new school year. 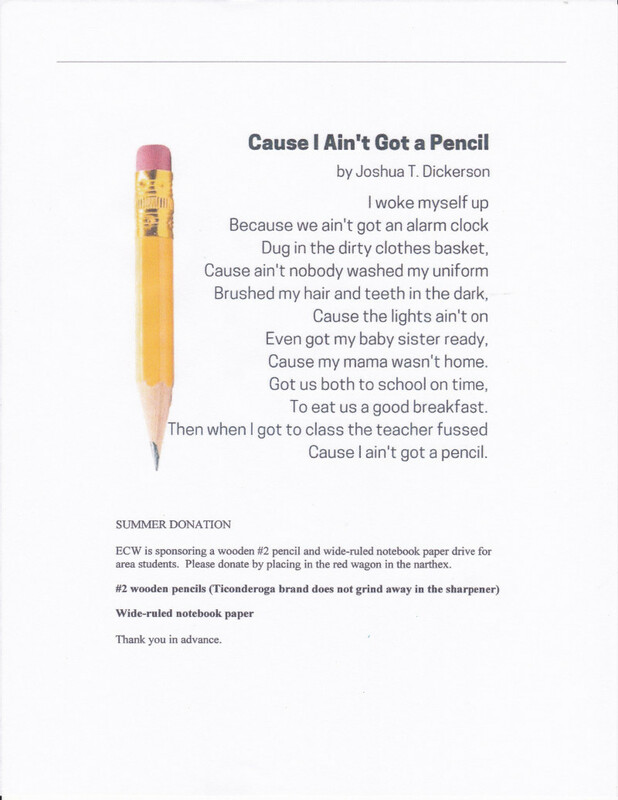 Also, we will bless the paper and pencils we have been collecting for Helena-West Helena school teachers. The last of the Together For Hope volunteers left at the end of last week. I appreciate St. John’s willingness to host these energetic folks from North Carolina and Texas. They make a big difference in our community and I’m glad we can be a part of their efforts. Especially, thanks go out to those who provided lunch for the volunteers on July 8th and 15th. Also, thanks to Paulette Parker for providing ice cream treats for the workers on July 11th. Angels of Grace and Anchor Mission ministries: The items from their wish list this week are laundry detergent & bleach. Humane Society of the Delta: Donations needed are dog & puppy food and large used towels.